But even during his final months in office, frailty did not keep him from playing his long-standing part as the Senate’s pivotal, hell-bent-for-leather iconoclast — self-deprecating and histrionic, bluntly combative and sounding impervious to the fray. Eleven days after a malignant tumor was excised from his skull, McCain disregarded physicians’ advice back in his adopted home state of Arizona and returned to the Capitol for a career-climaxing stretch in which by turns he played Senate scold, partisan savior, policymaking spoiler and legislative dealmaker. His first move was to excoriate colleagues in both parties for permitting partisan tribalism to eviscerate the legislative process. Then, he nonetheless provided the deciding vote that allowed senators to debate legislation repealing and replacing the 2010 health care law. Just 60 hours afterward, however, he stunned the capital with an after-midnight thumbs-down that proved the decisive vote denying Republicans their primary objective for the year. At that point, McCain set his focus on his own final legislative priority, assuring that the annual defense authorization bill proved the exception to the rule of partisan gridlock and won enactment for a 58th consecutive year. McCain was arguably the most accomplished GOP legislator at the Capitol since his friend and mentor Bob Dole, the former Senate majority leader and 1996 party standard-bearer, with whom he shared sustained national ambitions, a wry and sometimes cutting wit, a tough-to-corral irascibility and distaste for dogma. His stature as a war hero, from the five brutal years he was held in a North Vietnamese prison after his Navy fighter jet was shot down in 1967, propelled him into political office and gave him the sort of celebrity that automatically lifts only a few congressional careers to prominence from the first day — among them some of his frequent Democratic sparring and legislating partners in the Senate: the former astronaut John Glenn, the liberal dynastic patriarch Edward M. Kennedy and even the polarizing former first lady Hillary Clinton. That notability helped free him to be a congressional rebel, working with both Republicans and Democrats to find middle ground on normally divisive issues ranging from immigration to climate change, and from campaign finance to the makeup of the federal judiciary. He was pragmatic and nonideological on those and almost all other policies outside national defense, where he was the most influential voice for a hawkish and interventionist military posture since the man he succeeded as an Arizona senator, the 1964 GOP nominee Barry Goldwater. “We need each other. We need friends in the world, and they need us. The bell tolls for us, my friends. Humanity counts on us, and we ought to take measured pride in that,” he wrote in a memoir, “The Restless Wave,” published in late May. Through it all, McCain was never anyone but McCain — a singular force for originality at a Capitol where partisan and behavioral conformity has become close to a job requirement. He was direct, combative and opinionated but approachable, often liable to rise from his desk on the Senate floor to tell his colleagues just what he thought of them and their ideas. He was a conservative Republican who didn’t consider the party a straightjacket for his own ideals. This year’s defense authorization bill, managed with him ailing in Arizona, was named after him and was enacted earlier this month. His iconoclastic views, and a seeming eagerness to be viewed as a hell-raiser while advancing them, infuriated fellow Republicans and Democrats alike — at least as often as he endeared himself to both sides with his efforts. It was simply that he prized principles, values and the willingness to stand up for them, whether they were popular or not. If there was one word for his political brand, it was “maverick,” ironic given how that term for the politically unorthodox comes from the name of a 19th-century Texas rancher who insisted on leaving his cattle unbranded. McCain’s coltish independence proved a hindrance on the national stage, though, when he needed his party. He made a torrid run for the GOP presidential nomination in 2000 aboard a campaign bus he christened the Straight Talk Express but lost to Gov. George W. Bush of Texas. He claimed the nomination eight years later but lost in the fall to Sen. Barack Obama of Illinois, a campaign in which he cultivated (albeit briefly) an unbridled force of political nature more dangerous than his own by tapping Gov. Sarah Palin of Alaska as his running mate. His defeat that year was partly a question of timing: McCain’s indefatigable advocacy of an assertive American foreign policy didn’t seem to suit the war-weary electorate. But his cause was not helped by his decision to steer away from, and at times repudiate, the xenophobic and sometimes racist sentiments fueling the Republican base that year. Almost always willing to chat and spar with reporters, McCain sometimes went from being amusing and charming to blunt and testy in a few minutes. He could be particularly harsh with top national security officials, particularly those who did not share his interventionist approach to foreign policy. In 2015, he called for the firing of Joint Chiefs of Staff Chairman Gen. Martin E. Dempsey over disagreements about the U.S. strategy in Iraq. His relations with Donald Trump started on a sour note early in the 2016 campaign and only seemed to get worse. McCain had sought the party nomination in 2000 as the moderate alternative to Bush, the conservative favorite. Attracting many independents and some Democrats with his blend of fiscal conservatism and social moderation, he beat Bush in the New Hampshire primary but lost to him in the crucial South Carolina primary, a defeat that marked the beginning of the end of that quest. He then returned to the chairmanship of the Senate Commerce Committee, where he ended up holding the gavel for more than six years. He ran the Indian Affairs panel for two years in the 1990s and two more years a decade later. The singular leadership job he had craved his entire political career, and had been preparing for since his particularly rambunctious time at the Naval Academy, finally came his way by virtue of seniority in 2015 — the chairmanship of the Senate Armed Services Committee. McCain was an unabashed interventionist who saw America’s diplomatic and military engagement overseas as necessary. His view was at odds with Trump’s skepticism about American intervention and his complaints that America’s allies don’t pay enough for U.S. protection. McCain agreed with Trump that NATO allies should share more of the cost of the military alliance, but only after emphasizing how valuable the alliance proved in buttressing the American interventions after the 9/11 attacks. When Trump entered the White House, it wasn’t a big change for McCain to be a voice of opposition to the president on foreign policy — albeit this time, it was a member of his own party. In the first few days after Trump won the presidency, McCain made clear that he’d oppose any effort by the new chief executive to reach an accommodation with Putin. Any effort to “reset” relations with Moscow would equate to an acceptance of Putin’s aggressive moves in countries from Georgia to Ukraine to the Baltics and, in particular, Putin’s backing of Syrian President Bashar Assad’s civil war, he said. When Trump, at a press conference with Putin in Helsinki in July, seemed to back Putin’s denial of having interfered in the 2016 U.S. presidential election, McCain delivered a devastating statement. He’d spent much of the eight previous years criticizing national security decisions. Since 2012, he had been calling for U.S. air strikes on the Assad forces in Syria and establishment of “safe havens” for anti-Assad rebels. Although saying he’d honor his pledge to support the party’s presidential nominee, McCain put distance between his own 2016 re-election bid and Trump’s candidacy. He skipped the Republican convention in Cleveland, telling reporters in an offhand comment that he would instead be at the Grand Canyon. He won with 54 percent, well ahead of Trump’s narrow win in the state. Nonetheless, it was McCain’s smallest share of the vote in six elections. Trump wasn’t the first Republican president with whom McCain tangled. Although the senator was an unflagging supporter of the Iraq War, even as other Republicans edged away from Bush’s 2007 proposal for a troop “surge” to try to bring an end to American involvement, McCain said Bush “terribly mishandled” the war, and called for boosting troop strength far beyond the level the White House considered acceptable. In 2005, McCain pushed Congress to ban torture of overseas detainees, a move that Bush initially opposed. The president eventually backed down and signed the legislation. McCain bucked Bush on several other fronts. He voted against both of the president’s major tax cuts, in 2001 and 2003. He pushed for stricter fuel efficiency standards and limits on greenhouse gas emissions to combat global warming. He opposed energy exploration in Alaska’s Arctic National Wildlife Refuge. 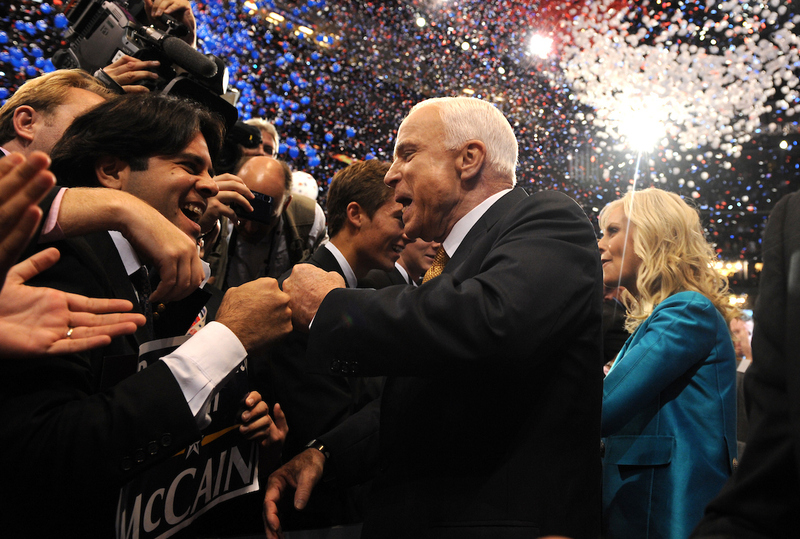 With the rise of the tea party, McCain was increasingly at odds with many in his party. In 2013, he famously labeled as “wacko birds” two of his most confrontational GOP colleagues, Rand Paul of Kentucky and Ted Cruz of Texas, later apologizing for his comments. He particularly differed with his party on immigration. He was one of the eight senators who wrote a bill in 2013 that included a path to legal status for immigrants in the country illegally. It passed, 68-32, with the votes of McCain and 13 other Republicans, but the House did not act on it. McCain also spent much time trying to persuade his colleagues to undo the limits on military spending imposed in a 2011 budget deal. But while he campaigned for more money for the Pentagon, McCain often criticized what he viewed as wasteful military spending. During the Bush administration, McCain spearheaded the investigation into an overpriced Air Force contract to lease aerial refueling tankers from Boeing Co. The extensive investigation, which uncovered what is widely considered the biggest procurement scandal in Pentagon history, ultimately resulted in prison time for a senior government official and a Boeing executive. John Sidney McCain III was born at the Coco Solo Naval Air Station in the Panama Canal Zone on Aug. 29, 1936, the namesake son and grandson of four-star admirals who were top commanders in the Pacific Fleet during World War II and Vietnam. Both of them had gone to Annapolis, and McCain did as well, although his rebelliousness contributed to his graduating fifth from the bottom of the 899-member class of 1958. After his liberation, he continued serving in the Navy and became its top liaison to the Senate during the Carter administration. During that work, in 1980, he divorced his first wife, a former model from Philadelphia named Carol Shepp, after 15 years of marriage. A month later he married Cindy Lou Hensley, a teacher from Phoenix and the daughter of that city’s Anheuser-Busch beer distributor, prompting his move to Arizona and a turn as the spokesman for the distributorship. They had a daughter, Meghan, and two sons, Jack and Jimmy, and later adopted a daughter, Bridget, from a Bangladeshi orphanage. McCain had earlier adopted his first wife’s two sons from a previous marriage, Douglas and Andrew, and they had a daughter, Sidney. All seven children survive him, as do his first wife, his widow and his mother, Roberta Wright McCain, who is 106. McCain first ran for Congress in 1982, winning the seat of retiring House Minority Leader John J. Rhodes by convincing voters his work for the Navy on the Hill had given him key insights into “how Washington works.” After two terms, he took 61 percent of the vote in his bid for the Senate seat being vacated with the retirement of Goldwater, who had risen to be Armed Services chairman during three decades as a senator. Early in his first term, McCain and four other senators — Alan Cranston of California, Dennis DeConcini of Arizona, John Glenn of Ohio and Donald W. Riegle Jr. of Michigan, all Democrats — intervened with federal regulators on behalf of Charles H. Keating Jr., whose California-based Lincoln Savings and Loan Association was under investigation for unsafe practices and possible criminal behavior. When the savings and loan was seized by regulators two years later, the “Keating Five” became the target of an Ethics Committee investigation that lasted more than a year. McCain was given a mild rebuke in 1991, and he pointed to that incident as his inspiration for becoming a crusader for changes in the campaign finance system. Afterward he was extremely conscious of shepherding his reputation, which is why the speech he gave to the Senate after his cancer surgery, on July 25, drew rapt attention. “Our system doesn’t depend on our nobility. It accounts for our imperfections, and gives an order to our individual strivings that has helped make ours the most powerful and prosperous society on earth. It is our responsibility to preserve that, even when it requires us to do something less satisfying than ‘winning,’” McCain said, using air quotes to emphasize his derision of one Trump’s favorite terms.